Like more-complex creatures of the animal kingdom, crickets exhibit behaviors that are studied by scientists for their uniquely advanced nature. Crickets are popular classroom pets for their interesting behavior traits, and particularly for their mating rituals. An insect with three body parts, six legs and antennae, a cricket is a cousin of the grasshopper that uses two pairs of legs for walking and the rear pair for jumping. 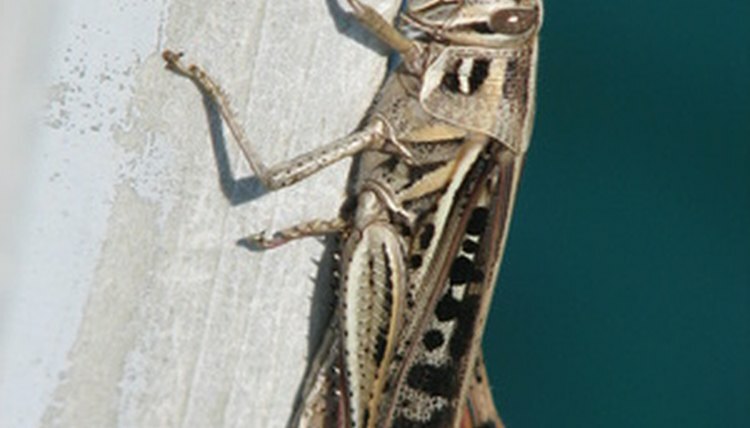 The cricket is black or dark brown in color; its most distinct characteristic is its wings, particularly those of the males, which use their wings to create a chirping call. According to the website Telusplanet, only male crickets sing and fight, and they can be extremely defensive of their territory. Males sing to look for a female mate or to signal to other males to leave his territory. The male cricket “sings” by rubbing his wings together, which have ridges that form a scraper and a file. By rubbing his wings together at a fast speed, the male produces a distinct song. Male crickets, when they are interested in a female cricket, will sing to the female even if she is a far distance away. Once the female is interested, males woo the female cricket with a softer song. Male aggression is also demonstrated through song, as male crickets have a song for challenging other males. If a male cricket is interested in the cricket's female, he will sit next to the singing male and intercept the suitor crickets song with his own, which is called satellite behavior. Noncalling male crickets, or crickets that do not sing in order to woo a female cricket, are less susceptible to parasites than their calling counterparts, which causes them to have a longer life span. Both male and female crickets are more active at night, but they sometimes can be seen or heard during the day. Male crickets can be defensive about one area that they call home, or they may move with other female crickets from one nesting area to another. Female crickets, which do not sing or fight, exhibit behavior that is different from that of male cricket. Females, once fertilized, can be seen sticking their ovipositor into the soil. The ovipositor is a long structure that grows out of the tail and is used to deposit eggs into the ground.